We’re awash with plastics, choking our seas, killing our wildlife, polluting our water and entering our food chain. The problem of plastics in the (sea) food chain is huge. A report earlier this year discovered eight million tonnes of waste plastic ends up in the sea each year. 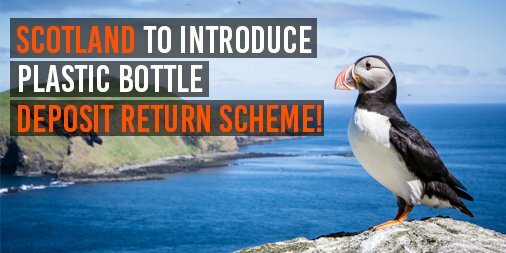 That’s why the Scottish Government announcement to create a Plastic Bottle Return Scheme is a huge breakthrough and testimony to the work of Greenpeace, Have You Got the Bottle, the Marine Conservation Society and others. The Scottish Government announced yesterday it will introduce a Deposit and Return Scheme for drinks packaging, and hold an international conference focusing on plastics waste in the oceans, together with a new £0.5m beach clean up fund. The problem – like most environmental issues – is that we are all culpable. We are all complicit in the system of consumption and waste that is destroying our home. This summer an all-woman crew sailed around Britain in the first continuous plastic sampling visiting Arran Stornoway and Edinburgh to highlight the issue aboard a 72ft challenge yacht Sea Dragon. “I live by the sea, and every day I see what the waves have brought in – rope, balloons, polystyrene bits, torn bags, cotton bud plastic middles by the million. Nurdles – pre-production plastic particles – are there too, if I get down into the sand to look,” said Arran resident and eXXpedition Round Britain co-mission leader Sue Weaver. ‘Today’s announcement by the First Minister is a massive step in stopping plastic pollution, and the result of tireless campaigning by many groups and individuals. With businesses and an overwhelming majority of the public in favour of deposit schemes, the Scottish Government now has a mandate to implement as robust a system as possible to help reduce plastic pollution. Hopefully it won’t be too long before the rest of the UK follows suit. This isn’t some soft-consewrvation beach-clean-up issue. This is about the contamination of our food and water. The issue now is in what the money raised should be put towards and whether this can mark a sea-change against pollution, waste and consumption in our throw-away society. This allows you to be the change. It would be good to see a move to reusable containers altogether – which might require overcoming cultural prejudice. I think the deposit return for bottles and cans idea is only at an exploratory stage. There are the obvious challenges of how it would work with existing kerbside recycling, whether it would promote a switch to supermarkets over small shops, and the potential trucking in of rUK containers to claim the bounty. Even more insidious is the plastic milk bottle and plastic water bottle. I read something yesterday about the aurora borealis being to blame for causing whales to become disoriented and to die. There was no mention of the number of whales whose internal organs had been rendered useless due to the volume of plastic consumed by the whales in oceans contaminated by us. They weren’t killed by the aurora borealis. Plastic killed them. Plastic we put there. We’ve had this scheme in Norway for many years now. It also applies to canned drinks. The plastic bottles are far sturdier and are intended to be re-usable. Every retail outlet has a machine that accepts your bottles and gives you a ticket back to a certain value that you can use in the shop. Despite this, as Norway has become wealthier, there are still those who throw away plastic bottles and cans by the side of the road or in street bins where they can’t be recycled. Immigrants short of cash can be seen going through street bins in big cities early in the morning or searching under park benches looking for them so that they ‘earn’ enough to buy themselves some food for the day. You can amass 10 kr worth very quickly and that will by you a skjillingsbolle (thick bun) enough to set you up for the day. Well of course it is churlish not to welcome the attempts to reduce this issue but I am not sure I want to agree with this-apart from in the most general sense of being part of an electorate the elected people like Thatcher. ” The problem – like most environmental issues – is that we are all culpable. We are all complicit in the system of consumption and waste that is destroying our home”. I just think that the consumerism that we all find difficult to avoid has been promoted and activated, not by the majority of people, but by ideologically driven people determined to ignore the (well known to anyone who bothered their arse) environmental degradation because it was an impediment to their profits and income. How long ago is it that we could have implemented a returnable system.Consumerism is like the ‘sweetie ration’ doled out to a compliant childlike electorate.It is a degraded form of existence that militates against human dignity, fairness and an approach to equality. Quite frankly unless and until governments address the causes of plastic pollution and legislate accordingly, millions of tonnes of plastic will find its way into the environment. But there’s money in producing materials,that we now know are devastating the environment, and quite frankly, there is no real desire or will to change it. And to boot, look at some of our citizens in cities like Glasgow ,and the detritus that is just dropped onto the streets, or the litter dumped in our beloved countryside. Our behaviour as citizens says much too. Of course, with economic stimulation, legislative intervention, public encouragement, there could be an impetus to clean up, find develop and produce new less polluting materials and packaging. Afraid the old cliche of Britain being the dirty man of Europe applies equally to Bonnie Scotland. If the Scottish Government is sincere in its desire to clean up Scotland why not consider the initiative of a ” Citizens Clean Up “. Through an advertising campaign folks across Scotland could be encouraged to participate in clean up parties. Supported with freely available clean up sacks, identified recycling points and technical support through a website-helpline, tens of thousands of folks could be voluntarily encouraged to socially participate in weekends of action where millions of items of detritus could be uplifted. And it wouldn’t just be the benefit of removing detritus from the environment. The participation in clean up groups would reinforce the culture of not producing waste in the first place, would encourage better or more considered behaviours,whilst potentially promoting better social cohesion. Such an initiative would be relatively cheap. A SG publicity campaign, support from the local authorities who already operate cleaning functions, with the rest coming free. Maybe worth a thought . . . .It could certainly be done with a little encouragement. I should think that standardization would be a great help, so that containers could be reused for many different contents, and can be mass produced to higher standards. Differences for marketing purposes (like the curvy Coke bottle) create vast inefficiencies. If everyone who throws away plastic packaging recklessly in the street would just throw it instead into the grounds of their local politicians’ homes, we would soon see the required change led by Government.